Hand sewing leather is usually done using one thread with two needles. I use waxed thread or sometimes I add bees-wax to un-waxed thread. 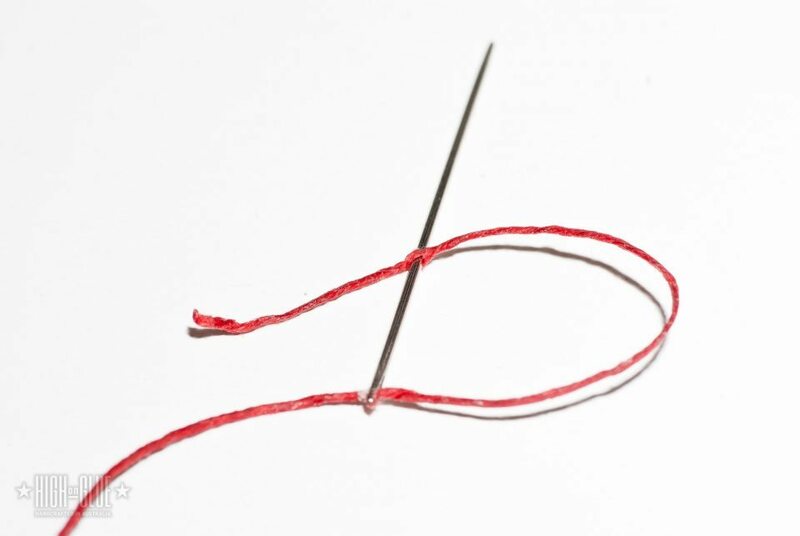 Waxing the thread prevents it from unravelling while sewing. To help push the thread through the needle, I cut it on an angle. 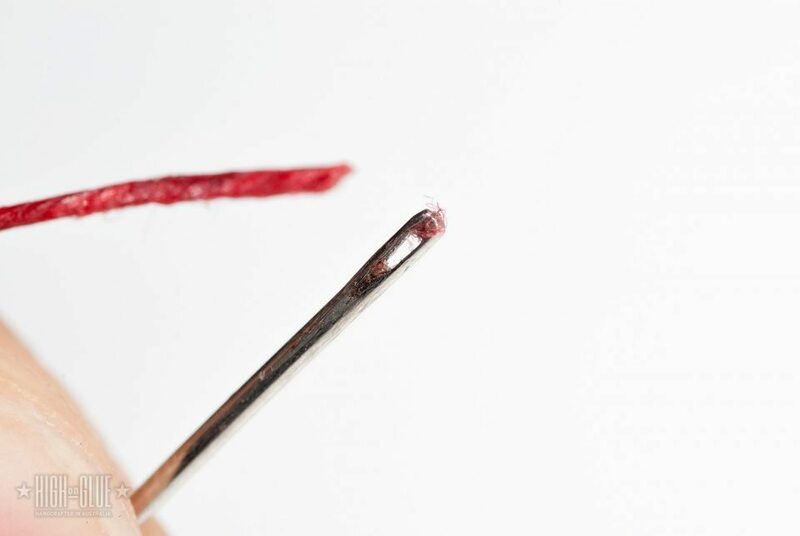 The wax keeps the thread together and it makes threading the needle easier. Pierce the thread. 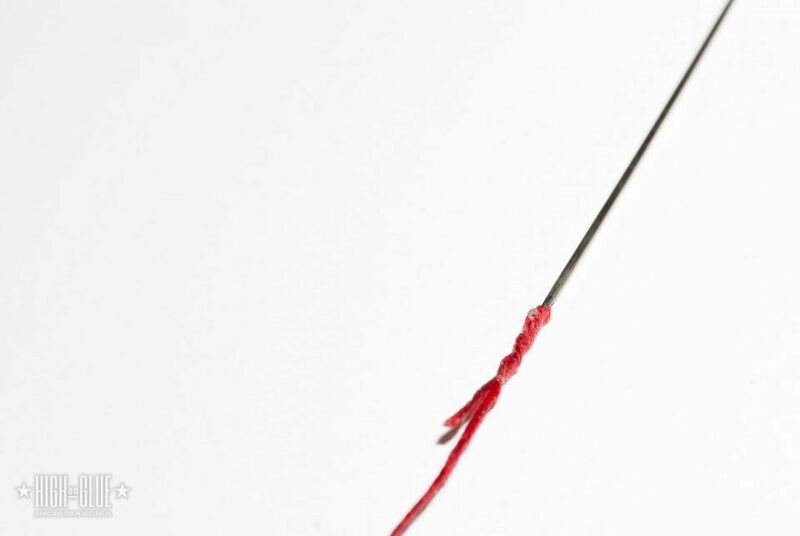 This will form a knot later and make sure that the thread stays in place. 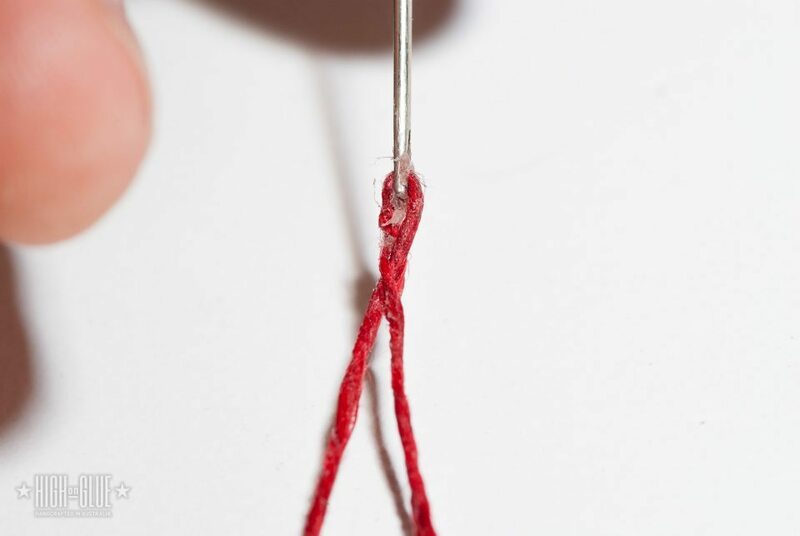 If you pulled it through all the way, youâll see that it formed a knot at the end of the thread (see above) and twist it to lock it in place. You can use some extra bees-wax to join the thread together if it doesn’t have enough on it already. 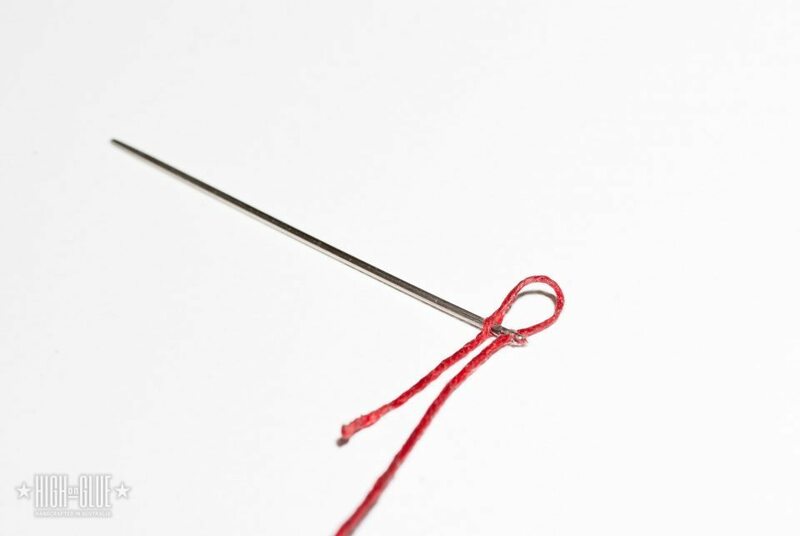 Repeat the same steps for the other end of the thread so you have 2 needles on one thread and then you’re ready for sewing! Now you can start hand sewing leather! Great blog you have here! I’m wondering about the size of the needle to the diameter of the thread. 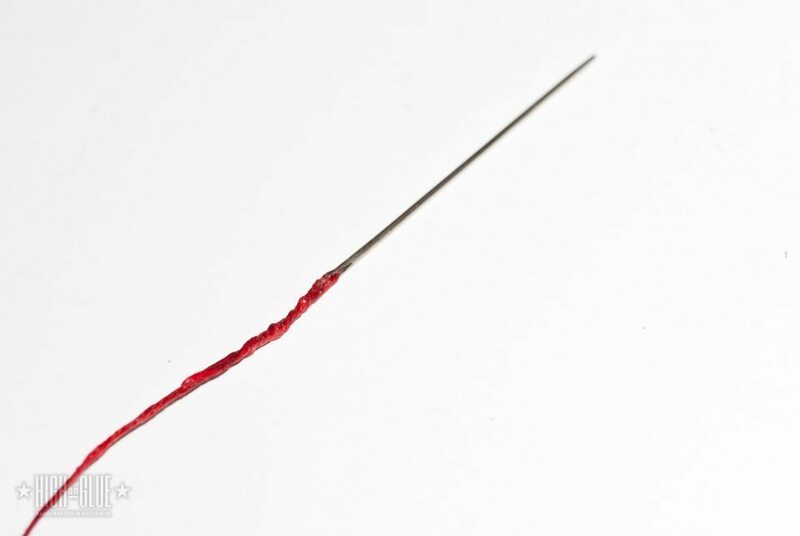 Do you have any advice regarding needle size if you are going to use 0.8mm thread or 1mm thread? I haven’t really come up with a way to pick the “right needle”. It depends on the type of material and what end result I’m after and then I usually just grab one that won’t take me too long to thread. With sewing machines it’s actually important to pick the right size needle but I don’t think it makes a huge difference when sewing by hand. I’d recommend that you get a variety of them in all kinds of sizes. I think you can get a large selection for a couple of bucks. If you’re pre-punching the hole with an awl, it’s also not important to have a sharp needle. Maybe someone who’s an expert on hand sewing needles can add some more information? I also bought one size up & one size down from the #2. The needles that I previously received with thread purchased on ebay are larger – perhaps one or two sizes up from the #2, perhaps more in some cases. Smaller needles help when using Nigel’s traditional English saddler style (e.g. using a pricking iron/wheel & saddler awl). If you are using USA-style diamond chisels that punch right through the leather, perhaps less critical. I am still undecided on best size. How do you know how much thread to use? I use roughly 4 times the length of the final stitch (often I add just a little bit extra just in case). What kind of waxed thread are you using?? I have been looking for that thread! (red waxed) Great tutorials by the way! Thank you. But recently I started to switch to Artificial Sinew . It’s also available in red and I prefer the feel of it. It also turns very shiny with age, which I like a lot. Thank you! Bought my first full side and tools today, time to create. I always like to come back to your tutorials, they are easy to understand and very thorough. What I don’t get though…in picture 4 there is an extra amount of thread in the “looped end” of the needle (the right side in the picture) but when you get to picture 7, that excess on the right is gone. 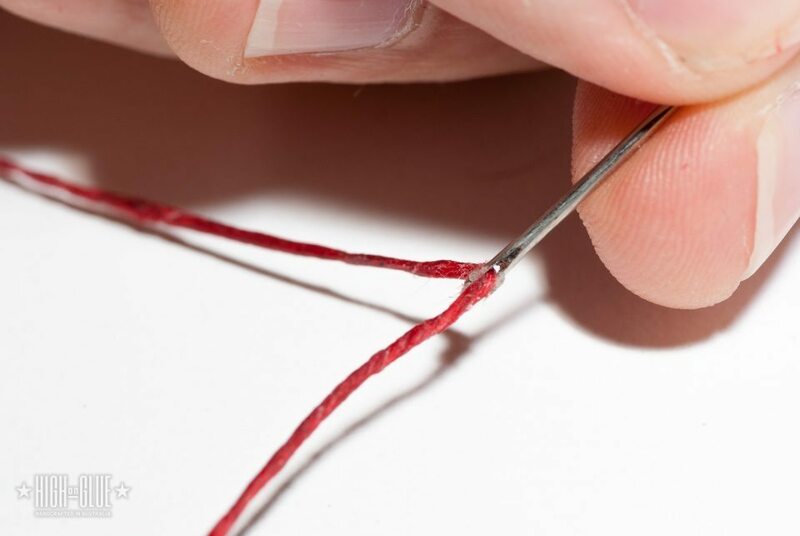 Every time I have tried this I end up with an excess loop on one side and the end of the thread on the other. If what I am saying makes sense at all…how do you avoid that? 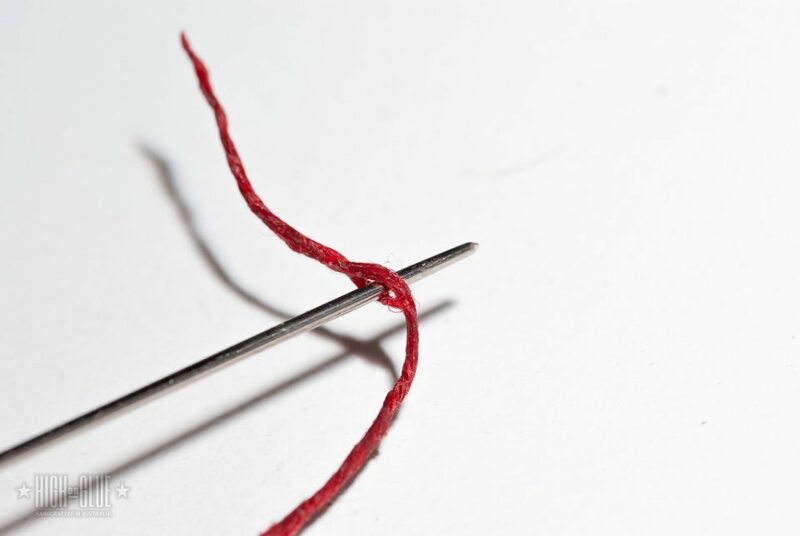 Pull the excess thread through before closing the knot.